In the 1970s, aftermarket fairings were huge. They become the essential accessory, the epitome of style and performance. In Britain, come the early 80s, one company stood above the rest: John Winthrope and Graham Miles’ Crossbow Equipe. 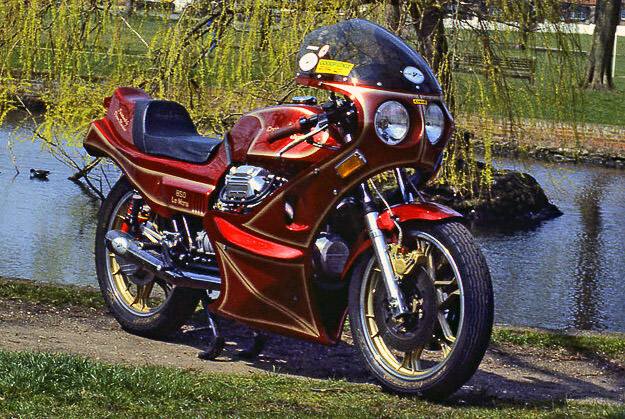 Crossbow’s marketing was partly built around the girlie calendars you see on workshop walls, and the company’s poster bike was this 1977 Moto Guzzi Le Mans 850. It had extensively modified bodywork: only the fuel tank was original. Nolan Woodbury of the excellent Vintage Motorcycles Online website has the full story, and some wonderful pictures too.